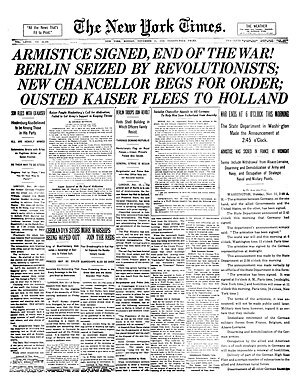 Front page o The New York Times on Armistice Day, 11 November 1918. A newspaper (eften juist cried a paper when the context is clear) is a periodical publication containin news, ither informative airticles, an uisually adverteesin. This page wis last eeditit on 2 Mairch 2018, at 21:18.